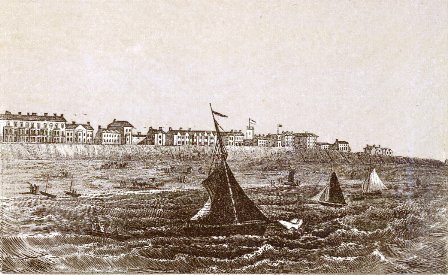 Lytham & St.Annes on the Sea Lancashire - Local History - College Francais, Blackpool 1855-1869. The College Francais was a private school established in West House, South Shore, Blackpool, in 1855. This building was on the corner of Waterloo Road and Bolton Street. The school later moved into larger premises (also known as the Queen's Hotel) on the promenade. The co-principals were two French brothers, Isadore Eugene Sanceau & Constant Auguste Sanceau. In September 1855, Isadore Sanceau married Emily Sarah Smith, second daughter of Christopher Smith of Dudbridge, Gloucestershire. Mr Smith was a partner in a wool dye works in Dudbridge. Four years later, Isadore's brother, Constant, married Mr Smith's other daughter, Annie Augusta. BLACKPOOL: THE FRENCH COLLEGE, SOUTH SHORE.-- The pupils of this establishment having concluded their half-year's labours on Friday, the 13th inst., a very large assemblage of the parents and friends met in the afternoon in the large school-room, West House, to witness the performance, by the students, of Moliere's comedy of "Le Bourgeois Gentilhomme," which was admirably played at the conclusion of a concert, in which the young gentlemen evinced much progress in the musical studies. M. Garreaud, of the Conservatire, Paris, the resident professor of music, favoured the company with several very difficult pieces on the violin, beautifully accompanied by Madame Sancean. The great object of the institution is to afford to the sons of merchants and gentlemen a thorough English education, combined with all the advantages of the continent—French, German, and Italian being constantly spoken. The school duties are directed by the Messrs. Sanceau and a large staff of English and foreign masters. The occasional teachers from Preston are Messrs. C. G. Hill, Gillins, and Casey. The college is beautifully situated on the Beach. The Preston Guardian, Saturday, 21st June, 1856. SHIPWRECK OFF BLACKPOOL. About daybreak on Monday morning, the residents of South-shore, Blackpool, were made cognisant that a vessel was on shore about 300 yards south of the Star Inn. The neighbourhood was soon alarmed, and M. Sanceau, of the College Francais, sallied out with his assistants, in a closed phaeton, taking with them blankets and other requisites. The vessel proved to be the British Token, of Dundalk for Preston. About ten a.m., three men, in a very exhausted state, were taken from her, and safely landed ; but the vessel was a complete wreck, and being laden with corn and meal, the coast soon became strewed, for a mile in length, with oars, broken masts, barrels, sacks, &c. One boy is said to have been washed overboard, who at four p.m. on Monday was still unfound. It is really a serious matter that no steps have hitherto been taken to provide a life-boat for the district. the danger of this coast k notorious, and the frequency of wrecks make it incumbent on the residents to supply the want so much felt in a case of emergency ; and though in the present case, perhaps, the lifeboat might have been obtained from Lytham to have released the men sooner than they were, we are satisfied that the sufferers on this occasion were in a most miserable and perilous condition for twice the tenth of time they needed to lave been, had proper succour been nearer at hand. The Lancaster Gazette, Saturday, 29th November, 1856. 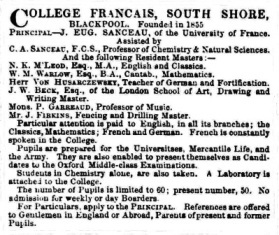 Advert for the College Francais, March, 1858. BLACKPOOL LECTURE.— On Thursday evening last, a very instructive lecture was delivered by Mons. C. A. Sanceau, jun., F.C.S., of the College Français, South Shore, in the infant school room, Blackpool, on "Water and its impurities." This was the first free lecture in connection with the Reading Room and Lecture Association, which is about being established at Blackpool and South Shore. Mr. Simpson, of South Shore, the president, was in the chair, and stated that these lectures would be monthly or fortnightly through the year. The room was well filled, and Mr. Sanceau treated his subject in a manner that gave universal satisfaction, and was frequently applauded. His apparatus and experiments were very superior in showing the analysis, synthesis, and chemical as well as physical properties, of water. The Rev. A. Jenour moved, and Mr. White seconded, the. cordial thanks of the meeting to Mr. Sauceau for his excellent and important lecture. Mr. Sanceau said be felt much pleased that he had given such satisfaction, and that ho should be ready to give another on chemistry or some other branch of education. The Preston Guardian, Saturday 19th June 1858. About 1862, Leon de Landfort became principal of the College Français. He was born c1823 in Corte, Corsica, France, though by the 1850s he was living in England. He published a book in 1856 entitled "A Guide To Youth: Or The Christian Philosopher's Lessons On Moral Duties, Virtue, And Etiquette." In 1861 he was a language teacher lodging at a house in Broughton, Manchester; the boarding house was run by Jane Ogden and he went on to marry her in 1863. SHOCKING ACCIDENT. —A YOUTH BURIED ALIVE.—On Monday, Mr. Myres, coroner, held an inquest at the College Français, South shore, near Blackpool, on the body of Christopher Howarth, between sixteen and seventeen years of age, son of Mr. Christopher Howarth, bleacher and coal proprietor, of Horwich, near Bolton. John Millington, of South shore, said : I was with deceased on Saturday last. I had gone from the college with him to make a cave, about half-way between the college and the Star Hills. When we got there we looked about for a spot where we could make one. We dug a cave with two small spades, and took it in turn to dig. We undermined the front of one of the sand hills. After we had out about five feet into the earth. I went on the top to see if it was safe. I thought it was perfectly secure, and told the deceased so. He then commenced digging again, and I stood a little on one side. Whilst the deceased was inside, the earth fell upon him, and some of it also fell against me and knocked me down. The deceased was covered with the earth, and I immediately went to the top and tried to get the sand off him. I cleared his back, and then same more sand fell upon him, then began calling for help. I saw a gentleman walking on, the sands, and he heard me call, but he did not come to me until some time afterwards. When he came he helped me to clear away the earth, but we could not move the deceased. Another boy of the name of Knowles was with us and he assisted us. Knowles was also on one side when the earth fell, and not on the top at the time the earth fell. The gentleman ran off for assistance when he found that we could not move him. As he did not know where to go I ran to the college and gave information. I afterwards returned to the spot, and fresh efforts were made to extricate him. I was sent to Blackpool to telegraph to his parents. When I left the spot his head was clear, but he was not got out. The deceased would be covered with the earth about ten minutes or a quarter of an hour. The gentleman I called to was the only person I could see about at the time. We had two spades with us. The spades were at first covered with the earth, and when they were got out we were afraid of using them for fear of cutting the deceased. There would be more than a cart load of sand upon the deceased. M. Leon de Landfort, principal of the College Français, South shore, said : On Saturday last, about six o'clock in the evening, in consequence of the information given to me by Millington I ran to the spot where the deceased was buried. I was joined by Mr. Horace Hardy, one of the professors, and we had the body taken out. In about a minute after we arrived we had the head uncovered. The earth appeared to have been about three feet in depth when first the deceased was covered, but much of the earth bad been removed when we arrived. I think he was quite dead when got out. He was in a kneeling position and his hands rather backward. I did not see anything of the spade. We tried every means to restore the deceased. The jury returned a verdict of "Accidental death." A YOUNG WHALE CAPTURED AT SOUTH SHORE.— On Thursday week, at the ebbing of the tide, a large fish was observed struggling on the sands, and after a speedy capture it was convoyed to the Seven Stars inn. A number of persons attracted by the circumstance, attended to inspect the gigantic curiosity, and among others, Mons. de landfort of the College Francais, who, perceiving it to belong to the whale species, telegraphed to the eminent naturalist, Frank Buckland, Esq. That gentleman, accompanied by a friend, came down from London by train on Friday. and their inspection resulted in an offer of £10 being made for the animal, which they pronounced to be a young whale, about a month old. The offer was, however. declined, as the then proprietor was deriving a good sum from an exhibition of the curiosity; but, proper attention not being paid to its sustenance, it expired, on Monday last. 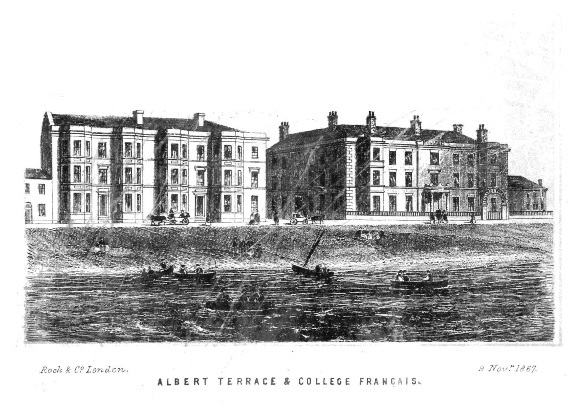 Albert Terrace and the College Francais, South Shore, Blackpool, 1867. Advert for the College Francais, October, 1868. Advert for the sale of contents from the College Francais, Blackpool, by Capes Dunn of Manchester, June 1869. The college was taken over by Isaac Gregory F.R.G.S. in July, 1869, opening it as the Merchants' College.